Top : Designers : Quest Marine Inc. Custom Boatbuilders with 65+ years expierence between my Dad & myself. We build in wood\epoxy, wood\composite, or all composite (inc. Vac.Bagged carbon\kevlar Parts). We can do line drawings for hulls & decks to build your boat from the drawing board up. We are capable of building class A Tooling for your production molds to be built on. We can finish to any stage of your choice up to building the first boat. We also specialize in high performance raceboats for offsore(cat or V-hull), and Opc SST60, 120, or Fomula-one Tunnel boats. 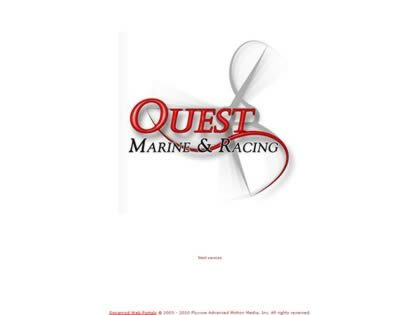 Web Site Snapshot: If available, above is a snapshot of the Quest Marine Inc. web site at http://www.questracing.com as it appeared when this site was added to the directory or last verified. Please Note that Boat Design Net has no involvement with the above web site; all content and images depicted in the above thumbnail are the property and copyright of Quest Marine Inc. unless otherwise noted on that site. Description: Custom Boatbuilders with 65+ years expierence between my Dad & myself. We build in wood\epoxy, wood\composite, or all composite (inc. Vac.Bagged carbon\kevlar Parts). We can do line drawings for hulls & decks to build your boat from the drawing board up. We are capable of building class A Tooling for your production molds to be built on. We can finish to any stage of your choice up to building the first boat. We also specialize in high performance raceboats for offsore(cat or V-hull), and Opc SST60, 120, or Fomula-one Tunnel boats.